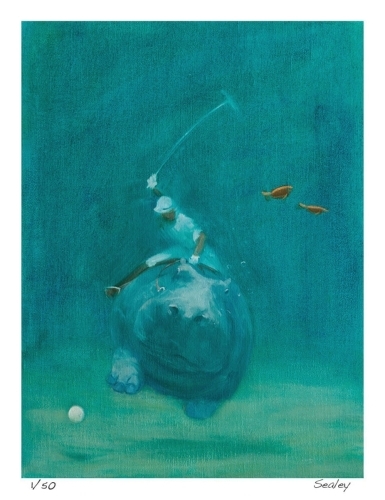 "Fearless and agile, the water polo hippo swims for the ball. 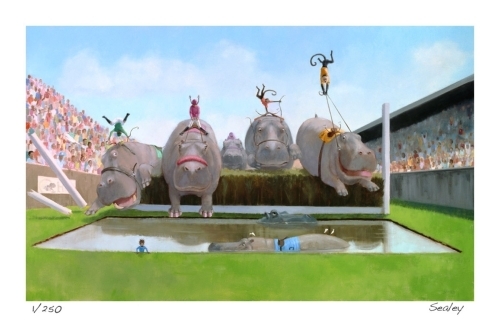 While many types of hippos are used in water polo, a slightly smaller and more compact hippo is usually favored. Speed, agility, and a sound temperament are the most sought-after qualities." Signed, Limited Edition giclée print on Somerset Velvet fine art paper. Print size is 16x20" (12 x 16 image with 2" white border). Print ships directly to you from the artist. 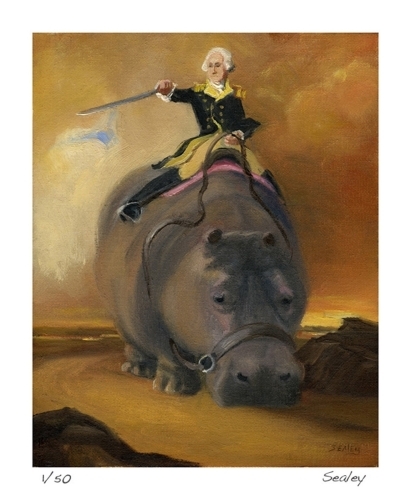 "I wish all y'all could experience the majesty of the great outdoors on an American Hippo. Have a great day!" Signed, Limited Edition giclée print on Somerset Velvet fine art paper. Print size is 18 x 21" (12 x 15 image with 3" white border). Signed, Limited Edition giclée print on Somerset Velvet fine art paper. Print size is 24 x 36" (18 x 30 image with 3" border). Easily displayed in a standard 24 x 36" poster frame without a mat. "Hi y'all! 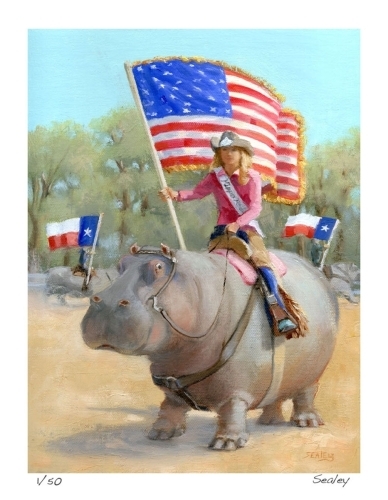 Here in Texas, we L-O-V-E rodeo! 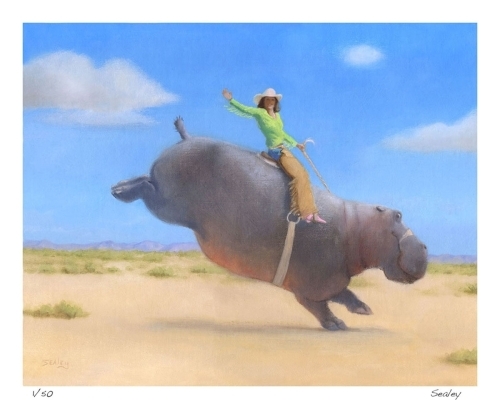 This is Dusty, my rodeo drill team hippo, and he is thrilled to be part of the Grand Entry parade." Signed, Limited Edition giclée print on Somerset Velvet fine art paper. Print size is 14 x 17 (9 x 12 image with 2.5" white border). Signed, Limited Edition giclée print on Somerset Velvet fine art paper. Print size is 12 x 14" (8 x 10 image with 2" white borders). Print ships to you directly from the artist. 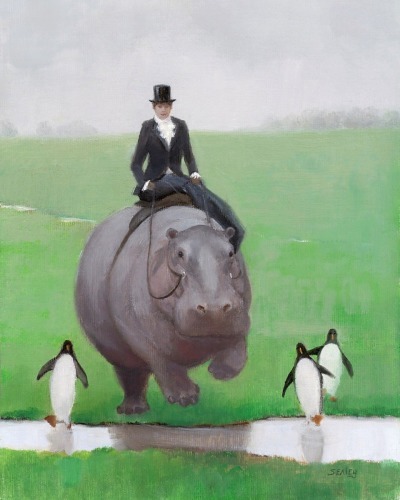 "In Victorian times, young ladies would ride their hippos through the parks. 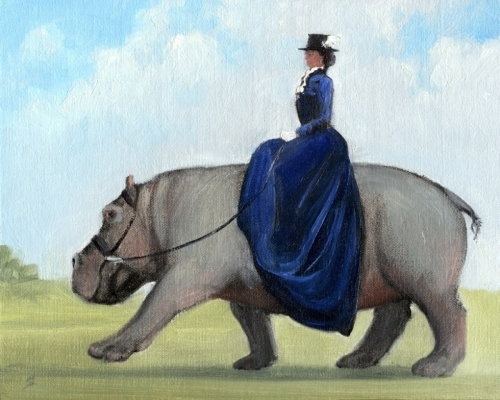 This painting shows a proper lady riding sidesaddle while her well-bred hippo steps out in style. Limited Edition giclée print on gallery-wrap canvas with a light gloss finish. Canvas print is 1.5 inches deep with white sides, and it can be displayed without a frame. Item will be shipped to you directly from the artist. Original is sold. Prints ship directly to you from Artspan.